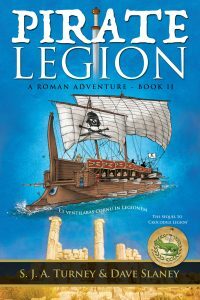 On the trail of a criminal collector of ancient treasures, the intrepid Marcus and Callie leave Egypt, bound for the island of Crete, where the mysterious villain known as ‘The Minoan’ awaits. While Marcus and the men of the Twenty Second Legion hunt for information on this shadowy figure, Callie takes the opportunity to investigate the island’s shipping records, for it is in these very waters that their parents vanished three years ago. Excitement and mystery, along with flee-bitten dogs and priceless statues await on the island of the pirates.